The more valuable the inventory and the smaller the size, the more likely it will mysteriously disappear from warehouse storage unless you provide some serious deterrence. The opportunities for pilferage increase if that storage area is near any building entrance, employee locker area, parking lot or other area where employees can stash goods until their shift is over. That’s why it’s so important to do cycle or inventory counts every time a load comes in, goes out, and even in between. Installing pallet rack with security caging assures that only authorized personnel have access and that high value goods are out of reach except when goods are actually needed.The wire caging is mounted to each face of the pallet rack, with hinged bi-parting doors on the front. The security caging can be added to only the first few levels of rack to deter easy access, or go all the way to the top. There are even rack enclosures with overhead doors that roll down to secure the entire section of rack. If you have numerous skus that are high value, easy to remove from a pallet, and/or moderate to slow movers, you might want to consider add-on security panels to enclose an entire section of pallet rack. Security panels are constructed of either woven or welded wire mesh welded to steel angle frames. 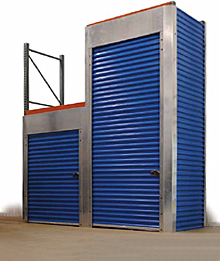 The partitions generally come in heights from 8 feet to 12 feet high and can be configured to fit the rack you have allotted to storage. Whether security caging, rack enclosures or wire partitions, an additional benefit from these products is enhanced safety. Ever seen one of those online videos where a pallet rack gets bumped and stuff suddenly starts tumbling off the top level onto the floor below? Sometimes all it takes is a bump from a pick module worker to dislodge goods on a pallet and send them showering down on your workers. Consider the losses in damaged goods alone. Now add injury claims from workers. Not a pretty picture. 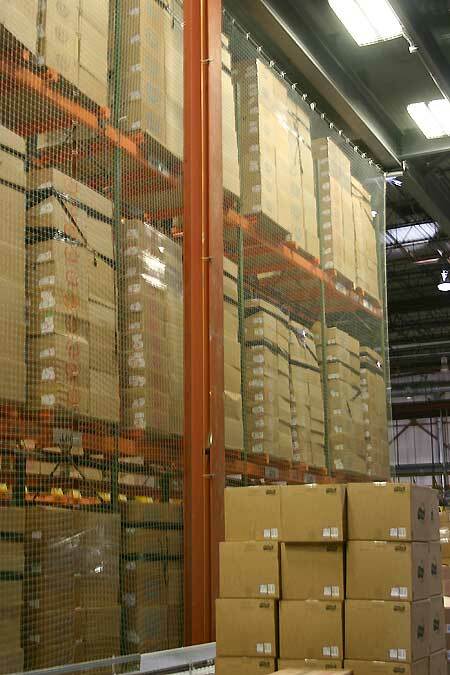 Especially when much of the problem can be minimized with the addition of safety netting or pallet rack backing. Made of large flexible mesh, safety netting is an inexpensive way to add safety and can be added to entire rows of rack (from top to bottom), to sections, or even individual bays. Added to the rear of pallet rack, it provides a buffer to help keep pallet loads from being pushed off the back. If a pallet should break, it keeps the load from coming apart and dropping off the rack. The netting can be mounted with a flush mount or with different offset distances as desired. The real advantage is in the safety factor it provides. No matter how light a box, if it falls from 30 feet and hits someone, it’s going to be devastating. For the right application, rack safety straps are another good method for reducing the chances of push through and product falls. 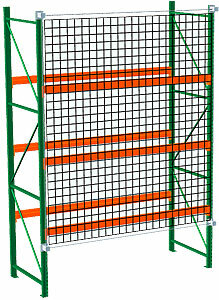 Pallet rack backing is a wire mesh panel product that provides a more rigid falling object protection barrier. Generally made of woven or welded wire mesh panels welded to steel angle frames, it is either flush or offset mounted to the back of pallet racks. Much like safety netting, it helps prevent goods from tumbling off pallets and to keep pallets from being pushed off the back side of the rack. There are many other products to enhance pallet rack safety. Most have to do with protection of the rack itself. Items such as row spacers which keep rack evenly spaced and stabilize the rack, and post guards, column protectors and cushions to take the bite out of fork truck impacts, all add to overall safety when working in and around pallet rack structures. Pallet rack isn’t designed to withstand horizontal impact forces. Regardless of the careful engineering done in designing pallet rack, if rack is hit often or hard enough, it will deform to a point at which it fails. That’s why having certified forklift drivers and serious operation standards in place is so very important. Hitting rack isn’t like just bumping one upright – each impact affects the entire rack structure. Once a weakness is introduced, stability begins to degrade with every subsequent impact. A few years ago, a security camera captured an entire warehouse of pallet rack taken down with one fork truck collision. Once you see something like this, you gain a greater respect for how easily one impact can take out your own warehouse. So, do all you can to increase safety to prevent costly product damages and loss as well as prevent injuries to workers.